This is part of Elizabeth's hand spindle collection. Also shown is some wools which she dyed using natural dyes. The magenta color comes from the cochineal insect, the light yellow from onionskins and the gold from Osage orange wood chips. The custom hand spindles (made by woodturner Gabe Jaramillo of www.handspindles.com) in the jar were purchased at the Needlepoint Joint in Ogden, Utah. 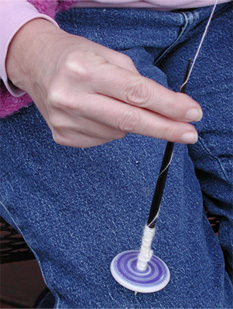 An AOL CD handspindle was made for the collection of spinning items that go to demonstrations where there are children. It is fun to watch a mildly disinterested child light up when they recognize that familiar CD. This a spindle made from an African porcupine quill. It has a whorl made of ceramic. It is a supported spindle because the point needs to be supported by something (like your knee). This contrasts to a drop spindle which hangs free and has a hook of some kind in its end. 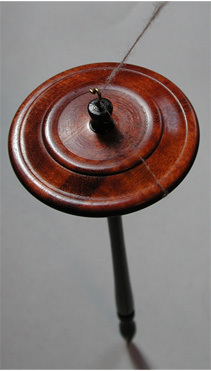 The hand spindle shown above is both attractive and functional. The whorl is Goncalo Alves and the shaft made of Ironwood. It was created by GA woodturner Janet Yost, whom we met a few months after we purchased it. 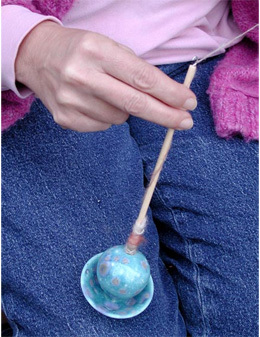 While "hanging by a thread" the spindle is spun (usually by rubbing it against the spinner's thigh) which puts the required number of twists into the thread that is desired by the spinner. Then the thread is unhooked form the hook and wound onto the axle. Wool is played out while the spindle turns and lowered (dropped) and the process continues. Even before Biblical times, spinners tended their flock and wandered about with their hand spindle at their side. Their hands were never idle. There is much information (and speculation) as to the number of hours required of a spinner to produce enough yarn for their first-born's clothes. Note that only the first born is mentioned because everyone else who came along got hand-me-downs. Think for a moment about the amount of spinning required to make a shroud or a sail. 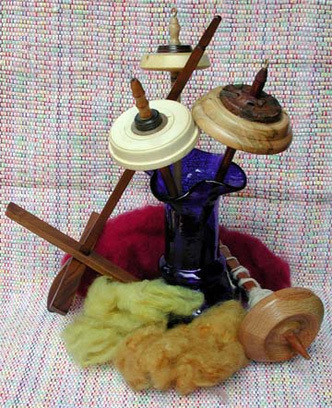 Sometimes during the spinning process, insufficient numbers of fibers or twists cause the thread to fail resulting in a dropped spindle--hence the name "drop spindle." We know one spinner who would never allow a fine spindle like the one above to fall on a floor for fear of either blunting the nicely turned finial end or shattering the piece. Above and below are shown another form of supported spindle. 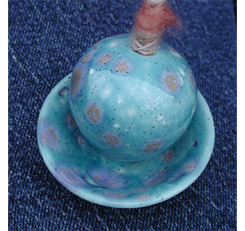 In this case the spindle is supported in a ceramic cup. A little dimple in the bottom of the bowl helps keep the spindle point centered. In the hands of someone experienced, this little gyroscope can coast for quite a while after giving it its initial twist. Making hand spindles of today has become sort of an art form. They appeal to folks who appreciate not only the functionality of the piece but also the beauty of it as well. The concept of spinning fibers has never changed, but like today, the tools seem to change based on social status. According to a 1523 author Anthony Fitzherbert "No rank is above the use of the spindle; princesses only have them gilt."